A§E (pronounced [eis] like the play card ace) is a set of psycho-acoustical tests to be used by the professional audiologist. It is conceived to test hearing impaired children and adults who are typically aided with a conventional hearing aid, cochlear implant or other device. Most tests are speech- and language independent and supraliminal (above-threshold). It is recommended to use A§E with a conventional audiometer. No additional equipment is required. A§E can also run with one of Audiqueen’s audio solutions, such as an amplifier and loudspeakers, the Otocube, Coala Link, SoundC or even with nothing else than a set of good quality multimedia loudspeakers. If used with anything else than a certified audiometer, the output sound levels depend on the sound card used. Very soft sounds may not be presented and very loud presentation levels may cause distortion. With this configuration the audio solution does not qualify as an audiometer according to ISO standards. The loudness scaling test uses narrow band noises centred at 250, 1000 and 4000 Hz presented at different levels. The results provide useful feed-back for the programming of the hearing device (hearing aid or cochlear implant). 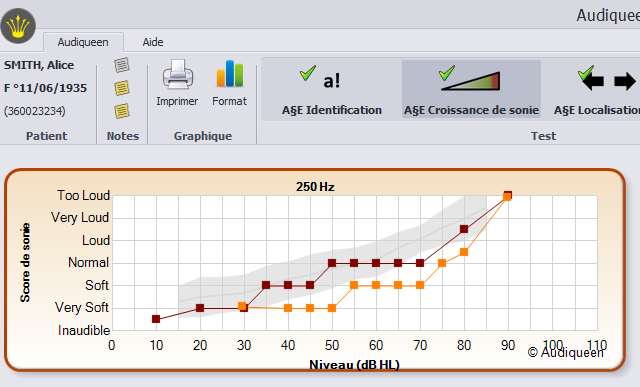 A§E loudness scaling results. The grey zone is the normal zone (95% confidence interval in hearing subjects).